AREDS2* demonstrated a statistically significant reduction of 9% in risk of disease progression to advanced AMD for patients receiving two of the three macular carotenoids (lutein and zeaxanthin) when compared with patients not receiving these antioxidants. 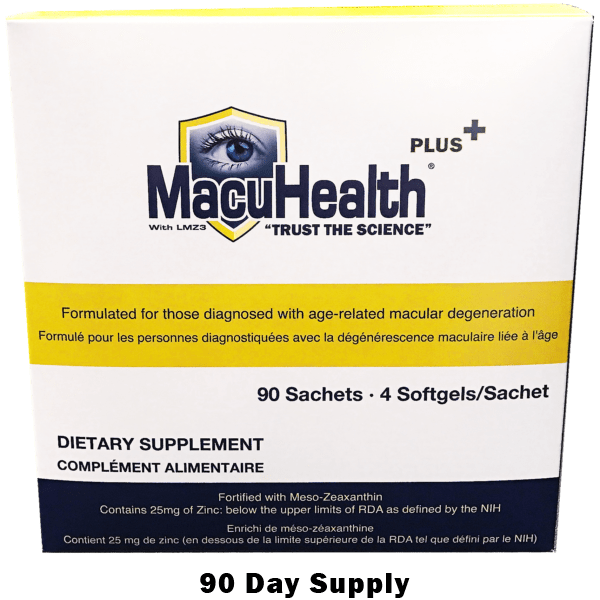 The reduction in concentration of zinc from 80mg to 25mg (as found in MacuHealth PLUS+) did not have an adverse effect on the desirable and observed reduced risk of progression to advanced AMD. Take one sachet of 4 Softgels daily (1 Carotenoid Supplement and 3 Antioxidant Supplements), preferably with a meal.